How do you crack the contact center productivity code? Expert Donna Fluss explains why workforce management applications are more important than ever. Figure 1. 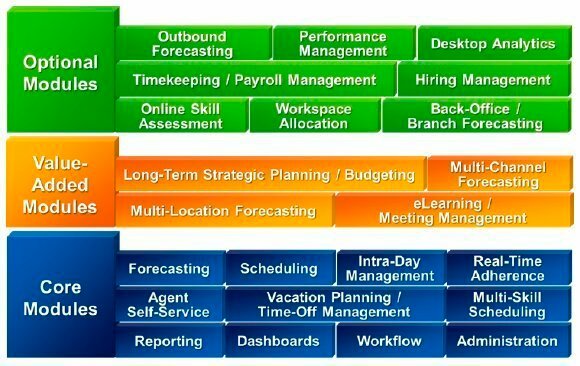 Workforce management functional modules. The payback from a WFM application varies and depends on the size and complexity of the contact center, as well as management's commitment and ability to change agent schedules. First-time users of WFM applications in contact centers with more than 200 agents can potentially realize staff-related savings of 25% to 40% if the application is fully used and they have the flexibility to alter staff schedules. Organizations replacing an existing WFM application with an application that has more advanced self-service, vacation and time-off management and intra-day capabilities should expect to see incremental savings of 3% to 6%. However, it's essential to point out that the most significant savings come from consistently applying the real-time adherence features that are instrumental for ensuring that agents are where they are supposed to be throughout the day. Today's contact centers need workforce management tools that strike a balance between the organization's need to keep their costs down and employees' personal preferences. The new generation of contact center WFM software comes with an agent preference capability. The WFM application starts by identifying the contact center staffing requirements, then fills schedule requirements using agent preferences as much as is practical. The extent to which agent preferences are favored over strict "efficiency" in scheduling can result in the delivery of suboptimal service during some hours. But when agent preferences are taken into consideration, shrinkage (unplanned sick leave and personal days) is typically reduced, so the result won't be as negative over time as the schedule might initially indicate. WFM analysts need flexible and automated intra-day management tools to alert them when contact center performance falls outside an acceptable range and to modify schedules and notify agents about any changes. Intra-day management tools accurately capture real-time performance data from different sources, including your automatic call distributor, email application, SMS system and other channels throughout the day, allowing managers to make immediate adjustments to schedules when volumes and staffing differ from the forecast. Intra-day management adjustments vary from changing agent break times on the fly to creating overtime slots to ensure coverage during understaffed intervals to offering voluntary time off or early leave to improve the center's efficiency. Donna Fluss, president of DMG Consulting LLC, is a highly regarded expert and thought leader in contact centers, analytics and the back office. Her 30 years of hands-on experience helping organizations build contact centers, enhancing back-office operations and assisting vendors to deliver competitive solutions, gives Donna unparalleled insight into the market. She is a prominent speaker, author and source for numerous industry and business publications. Donna can be reached at Donna.Fluss@dmgconsult.com.